I made this for the "Sweet Little Angel" Baby Shower last year. 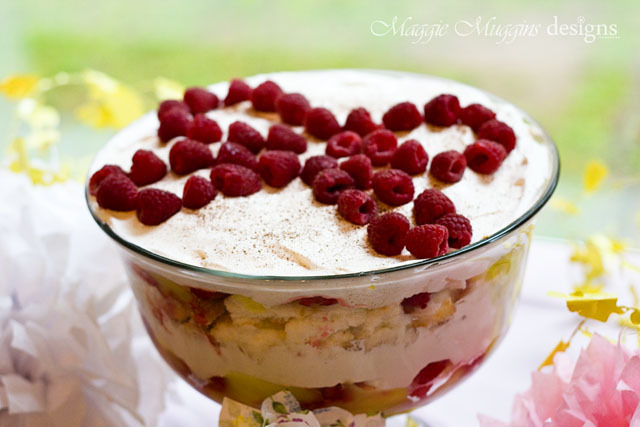 This is such a delicious trifle. I'll show you a fun spring variation of it sometime. But for now, I'll share the recipe. 1. Gather all the ingredients near your trifle bowl. Once you have the pie filling prepared you want to put this together quickly, before it sets. 2. Cut or rip the Angel Food cake into small cubes. Start the first layer in your trifle bowl with half of the cake. Tightly pack the cake pieces. 3. Prepare Lemon Pie Filling as directed on the package with the Egg Yolks and water. I cook it in the microwave. 4. Allow the Pie Filling to cool just slightly (1 minute). Pour half of it over the Angel Food Cake layer. Top with a layer of Raspberries, then completely cover the layers with Cool Whip. Lightly sprinkle with Cocoa Powder. 5. Repeat the layers again with the rest of Angel Food Cake tightly packed, the last of the Lemon Pie Filling over that, more Raspberries, and another thick layer of Cool Whip. Lightly sprinkle with Cocoa Powder and decorate with fresh Raspberries, or Lemon Zest. On this trifle I used Raspberries to make Angel wings to go along with the theme. This is really a simple desert to make but it is extremely delicious! Note: I didn't have a trifle bowl, but I found this one at Target for $10.39! It's beautiful and absolutely perfect. The trick is for the bowl to be deeper, not a larger circumference, otherwise too much of one item is required for each layer.